NOTRE DAME, Ind. - It was a cold day outside and a freezing day from three-point range for Notre Dame (11-7, 1-4). The Irish couldn’t quite get over the hump against No. 17 NC State (15-3, 3-2) on Saturday afternoon as the Wolfpack held on for a 77-73 win at Purcell Pavilion. Notre Dame shot just 25% from three-point range and 40% from the field, while NC State hit 36% from deep and 43% from the field. The Irish had chances as they cut the Wolfpack lead to a bucket multiple times in the second half behind a career night from freshman Dane Goodwin. The 6-foot-6 guard scored 17 of his 19 points in the second half, including seven in a two-minute span to cut the lead to 54-51 with 12:48 to play. But the Irish just couldn’t quite get a bucket when they needed one late in the game. “It's been very frustrating for me not to be able to find a consistent offensive rhythm,” explained Brey. “We have some skilled offensive guys out there and getting looks. We just haven't been able to do it. It just puts so much pressure on your defense. Goodwin’s 19 points tied a career-high, but he also added four rebounds and three assists. NC State guard CJ Bryce answered Notre Dame at every turn in the final 20 minutes. John Mooney got an easy dunk to bring the Irish within 62-61, but Bryce answered with a three-pointer following a Devon Daniels bucket to give the Wolfpack a 67-61 advantage. Bryce had a game-high 23 points on 9-for-14 shooting from the field. Mooney finished the game with 19 points and 16 rebounds, which was his fourth-straight double-double and an ACC leading 10th double-double of the season. 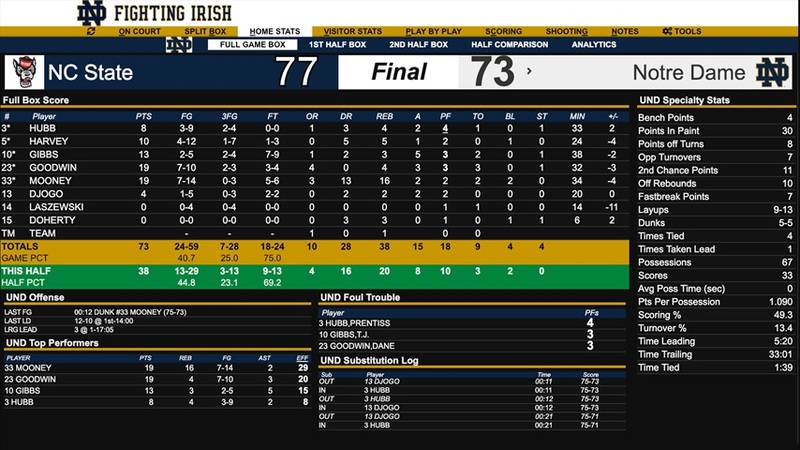 Goodwin hit 1-of-2 free throws with 1:32 remaining to pull the Irish to 73-68 but Nik Djogo missed a three from the corner with 44 seconds to play. Notre Dame didn’t give up as they cut the lead to 75-73 with 12 seconds to play on a Mooney dunk. However, Daniels calmly knocked in two free throws to put the game away. It was an up and down first half for both teams as NC State led for 13:17 but never more than eight points. Notre Dame shot just 37% from the field and 27% from three-point range. NC State wasn’t much better behind the arc (29%), but the Wolfpack shot 44% from the field. 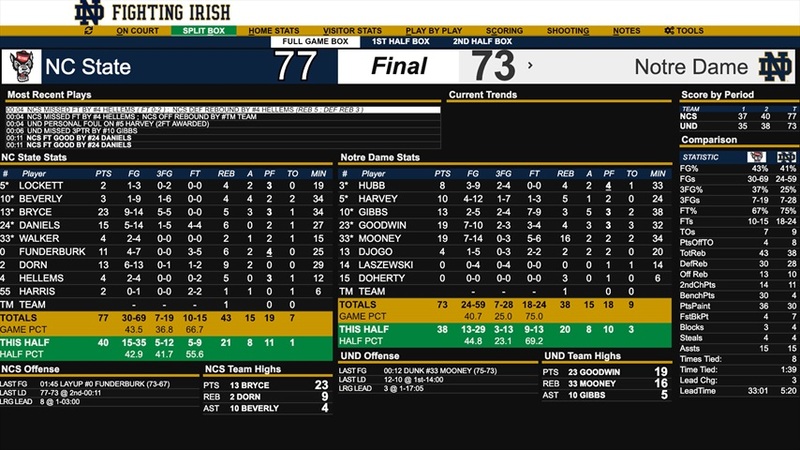 The Irish started off shooting 43% from the field but needed a Gibbs three-pointer to end a 1-for-11 stretch from the field for Notre Dame with just over 10 minutes to play in the first half. Freshman forward Chris Doherty made his Notre Dame debut with 9:11 left in the half and immediately gave life to the Irish. 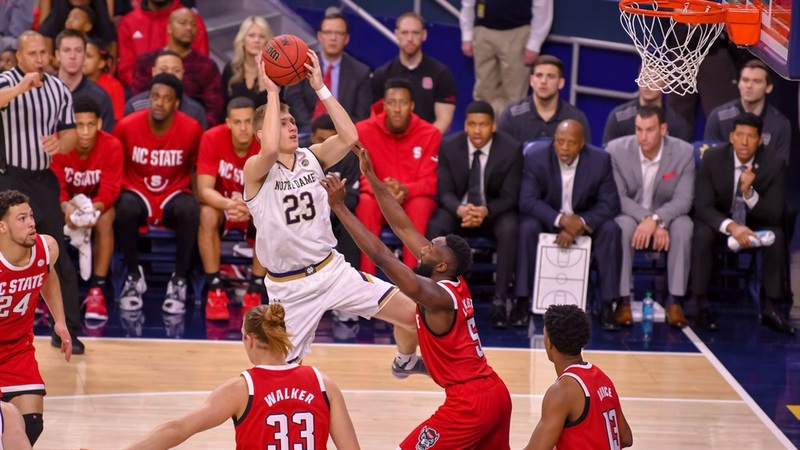 The 6-foot-8, 225-pounder pulled down a rebound and got fouled, which gave the Irish a boost in energy. “He gave us good minutes and he’s a warrior,” Brey said of Doherty. “I could care less about redshirts. That can be a little overrated. You can always redshirt a guy. We need to have him ready. He’ll play on Tuesday and the rest of the way. Junior guard Nik Djogo also provided a boost off Brey’s bench as he finished with four points, two rebounds and two assists in 20 minutes. Bryce scored 12 points for NC State in the first half.